The huge continent of Africa contains staggering biodiversity, with environments ranging from arid deserts to tropical jungles and climates ranging from tropical to subarctic. Whether in the savanna of Tanzania or the Congo jungle, Africa hosts numerous plant species. Many African plants are native exclusively to the area, although some may be cultivated elsewhere in the world. Blue flies (Aristea ecklonii), also called blue stars, is an evergreen perennial member of the lily family. A native of Central and Southern Africa, blue flies sports thin, grass-like leaves accented by delicate "true blue" flowers. Excellent as a container plant or as a border plant for a naturalized garden, blue flies is a sturdy plant that will grow in USDA Zones 8B to 11. Blue flies is quite versatile, and will tolerate full sunlight or light shade so long as it has a humus-rich, well-draining soil to grow in. The plant is a bit of a water hog and should be watered frequently during the summer. Montbretia (Crocosmia × crocosmiiflora) is a flowering upright perennial that hails from South Africa. The plant has long, sword-like green leaves and thin stems that burst into color in the summer with ruffled orange or yellow flowers. Montbretia is a good addition to a woodland garden, and may be used as a natural-looking border plant. Montbretia is fairly hardy and pest free, though spider mites can be a problem. For best results, grow montbretia in full or partial sunlight in USDA Zones 6 to 9. The perennial should be watered as necessary: more in the summer, and less in the winter. Mulch during the winter if possible. Oleander (Nerium oleander) is a flowering evergreen shrub that belongs to the dogbane family. The plant hails from North Africa, and will grow in USDA Zones 8 to 10. Oleander is a prolific bloomer, producing dense clusters of pink, white or creamy yellow flowers, depending on the cultivar. The plant makes an excellent specimen shrub or privacy screen. Many cultivars of the shrub produce flowers that are heavily fragrant. 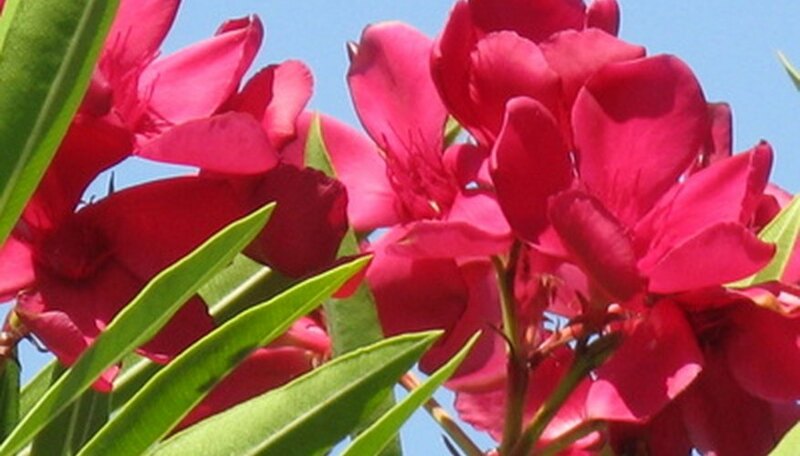 Oleander prefers full sunlight and well draining soil. Though somewhat drought tolerant, the plant won't reach its full potential unless watered occasionally. Like so many other members of the dogbane family, the plant is toxic and should never be ingested, or even overhandled.